What's a craft brewer? A small one perhaps? One that is innovative and makes their beer to precise standards using the finest ingredients? One that uses traditional methods, or seeks genuine full on taste and quality in what is produced? One that isn't produced in bulk and is only distributed on a limited basis perhaps? Something that is of higher quality maybe? Something artisanal could be an answer, but then you get into the problem of agreeing (or not) about yet another definition. It's all a bit tricky isn't it? I was reading that America's oldest brewer Yeungling is buying a closed brewery in Memphis with a view to increasing its distribution beyond its current 13 states. The brewery was closed by Molson-Coors (not the current owners) and was first constructed in the 1970s to brew Schlitz. It can brew rather a lot of beer, as can Yeungling; currently its production is over 2 million US barrels. What really caught my eye though was the headline " Former Coors plant in Memphis to be acquired by craft brewer Yeungling". Now clearly the US isn't here and we should always be wary of blindly following what the US does. (A different subject, but pretty good general advice as it goes). Yeungling is by all accounts, a pretty good brewer which is becoming a bit of a cult, but is it really a craft brewer? Would we call a brewer producing 2 million barrels of beer a craft brewer here? I suspect not. Of course scale is different there. The (American) Brewer's Association defines "craft" as being under 2 million barrels a year, so Yeungling must have been pushing at that door for a while and presumably will cease to be "craft" soon. So it's size then! Or is it? There is more suggested attributes of craft brewing here. Hmm. All seems a bit woolly. Nonetheless, the word is gaining a lot of currency in British brewing and blogging, but it is one I'll be using very sparingly and probably, like a lot of others, inappropriately. *"When I use a word," Humpty Dumpty said in a rather scornful tone," it means just what I choose it to mean -- neither more nor less." I'm always interested in anything that affects the pub trade and its ability to work well within the financial constraints currently facing their businesses. PubCos are often a target of my scorn and in some ways this article is no different. For many tenants, already dealing with high rents and expensive beer, as well as restrictions on choice, there is the added burden of beer dispense measuring equipment, mostly supplied by a firm called Brulines. 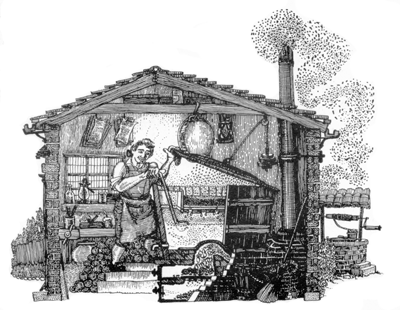 The publicans' views are fairly straightforward; the equipment is inaccurate and additionally, fails to take into account liquid used to clean lines, as well as unsaleable cask beer and results in accusations of buying out, with resultant fines and general unpleasantness. Brulines say it is accurate, but have up till now refused to have it officially tested by the state owned National Measurement Office (NMO). Now they will, but under conditions that aren't being released. In a Morning Advertiser article, Simon Clarke who campaigns against the device says "One would think, if a company had confidence in the accuracy of its products, that it would engage the NMO and require a full and public testing of the equipment. Secret testing to be paid for by the very company seeking the endorsement in itself fuels the fire of suspicion that this is nothing more than an attempt to enable manipulation of the testing conclusions into a positive spin." Now I have no real idea of the rights and wrongs of this, but it is important though, as we are talking, according Clarke, about big bucks. But what we do undoubtedly see is yet another example of how PubCos, either by intent or incompetence, make life difficult for their tenants, rub them up the wrong way and more importantly, clearly illustrate the sheer lack of trust that exists between the two parties. As pubs close and customers revert to home drinking in droves, you can't see how this can have a positive outcome for either side. It's all a bit, you know, undignified. The trade is littered with such unwholesome and divisive stories and none of them make it look at all good. The Morning Advertiser has the story in all its gory detail here. Not really sure if it will make CAMRA feel that much better, but there will surely be just a little bit of schadenfreude in the corridors of CAMRA Towers in St Albans. After my trip to London I fancied a good old cool, well conditioned, sparkled Northern pint or two, so met my mate Graham in the Angel, which is by the way, not being knocked down, as some rumours allege. Southport Brewery's Natterjack fulfilled that basic human need, but of course, after a couple, the siren call of the Marble Arch, a mere two hundred yards away, as always, lured us in. It also has the advantage of having my bus stop right outside it. Now listen lads. We all know you brew very good beer, but don't go telling me how it should be served to me unless you warn me of your silly preferences before I order and then I can safely over rule them. If you are going to continue to single Dobber out for unsparkled treatment, put a bloody notice up to that effect. *And no, it didn't look or taste as good as a sparkled one would. In my opinion of course. 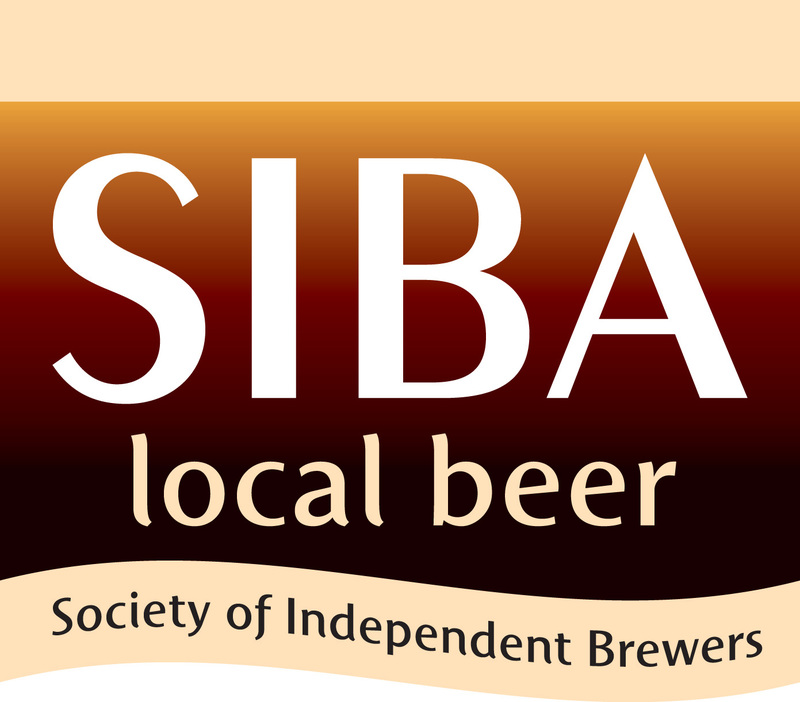 The Society of Independent Brewers has changed its logo. Gone is the previous handpump dominated logo illustrated in my blog piece here. The change is "in recognition of the growing importance of packaged craft beers among SIBA’s member brewers". Not a great surprise in some ways, but interesting that the word "craft" is being used. I think this will make little difference to what brewers produce in the short term, but maybe there is a nod to the future here and a recognition that the way we drink beer in the UK is changing and diversifying. The logo will make its main debut at the Great Northern Beer Festival in Manchester on 28th-30th October. It'll be on all the glasses etc. This is a good time to remind readers of this event. I'm off to an organising meeting for it on Wednesday and it promises to be a fantastic event in a great venue. It really will be worth a special trip, so hopefully I'll see some of you there. I've written about the Castle in Furnival Street before. I like it as a pub. Hidden down a side street off Holborn, it is as you'd expect during the day, a haunt of business types in suits. I used to wear one you know; every working day for 30 odd years, so it still feels somewhat discomknockerating to feel out of place amongst them, by being dressed in mufti; but I digress. The pub is bright and airy, one single room, with a bar and many beers. I tried two of them in halves. Both were pretty flat and turgid looking, though fresh enough. Derventio Emperor's Whim, was as odd tasting as its name, while Dark Star Espresso had its light hidden under a bushel by poor cellaring and presentation. Not GBG quality on this visit. I was tempted by the Mitre as I passed, but I decided to save that for the return journey. Instead, a ten minute walk to the Gunmakers and a cheery welcome from landlord Jeff Bell. Purity Mad Goose was on and this provided such a good return on investment quality wise, that my intended trip to the Mitre was forgone while Jeff and I caught up and discussed this and that. My pints - yes it was pints by then - were in tip top condition and properly pulled through a sparkler. Others at the bar were giving Woodeford's Wherry some serious biff, though their preference was an unsparkled pint. It still looked good though. My plan was then to meet E after work. Her workplace now is in the heart of Soho. I'd not been down that way for many a year and had forgotten how interesting and diverse it is. After a cursory look at her anonymous building, E led me through a maze of narrow streets to the Old Coffee House, a pub leased by Brodie's Brewey and featuring their beers. The pub is wonderful, with every available space filled by bric-a-brac and photos. (Our spot featured some interesting handwritten letters by David Beckham from his early days at Man Utd.) Our beer choice was Amarillo which was clean, hoppy, cool, but slightly flat. 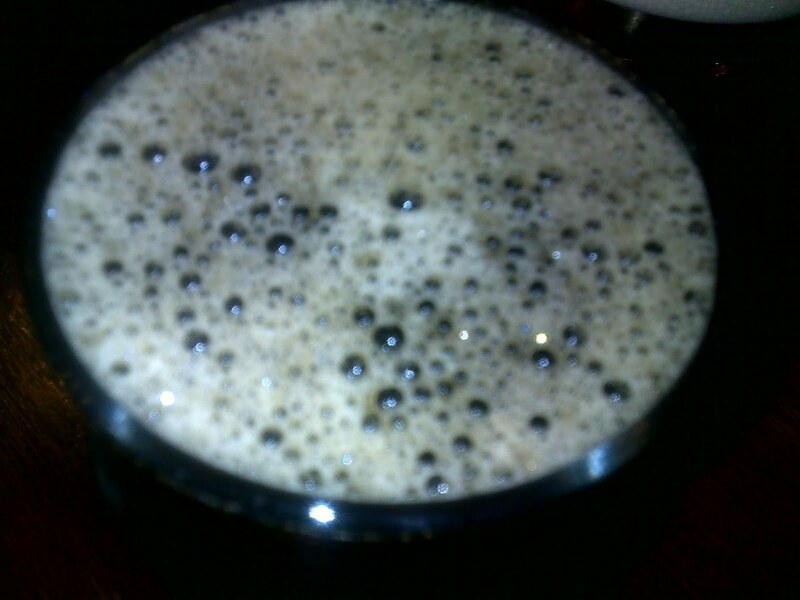 It had condition, but somehow the presentation rendered a beer which entirely lacked even the merest trace of head. That just doesn't look attractive. I tried the Brodie's IPA too, which was decent enough, but lacked character and oomph. Still, overall, rather good. They even had smoky bacon crisps, so what's not to like? I'll be back. So, as the title says, a bit of a mixed bag. This ends my little trilogy of London GBG articles, but I'll leave you with this thought. My visits are a snapshot and may or may not be representative of the pubs taken over a longer period and more experiences, but most people use the GBG for just such one off visits. For them that's how it is. A quick ten minutes walk towards London Wall takes me to two Good Beer Guide boozers in the same street - well I say the same street and it is, but with two different street names. The first, the Nicolsons operated Crutched Friar, is an interesting place and is so popular with suits that you will feel completely out of place if you aren't wearing one. There's a good selection of decently priced beer here. My two halves, one Thornbridge Lord Marples and the other of Brewdog Punk IPA were rather warm and poorly conditioned. Shame. I don't care for Lord Marples at the best of times and this wasn't the best of times. The Punk was grapefruity and alcoholic, but didn't impress either. 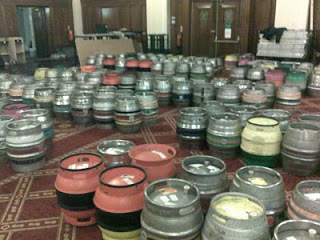 Not good for a busy pub, where cask beer was turning over pretty well. It was a different story fifty yards away at the Ship, a neat little one room pub, which despite a rather pedestrian choice of beer, seemed well run and popular. The ubiquitous Doom Bar, Courage Best, Spitfire and Butcombe hardly enthrall, but you could see they were well looked after. Cool, sparkled and bright was the order of the day. My Butcombe Bitter was brown. It was spot on condition and temperature wise, but tasted of virtually nothing. While you may dislike the choice, you couldn't argue with the quality and cellarmanship. A further ten minutes walk took me along the astonishingly busy Fenchurch St, where heads turned, including mine, as a girl in a short crimson dress walked across the road, a vivid contrast to the dark suited (male and female) conservatively dressed mass. At the end, a right turn and into the Crosse Keys, a large JDW. Two beers tried here; Bateman's Autumn Ale and RCH Old Slug Porter. Both were cool and in GBG form, but why nothing pale and hoppy with 21 beers on offer? Back towards home now and the White Swan in Alie St. Now readers of this blog will know I'm no fan of Shepherd Neame's beers, but the Whitstable Ale, though predictably harsh, had some leafy hop and was cool and well conditioned. Whether it was worth an astonishing £3.40 a pint is an entirely different matter, but no other complaints. Last port of call was the Dispensary in Leman St, where a half of the new Truman's Runner was slightly warm, but well conditioned, though to my taste a bit too malty. The bitter, hoppy finish did make up for it somewhat, but that elusive "drinkability" just isn't there. My final half was from Dark Star. Oktoberfest was a bit dark compared to the current Munich offerings, but was made with German malt and hops, with a full bodied bitter finish. It was pretty decent really, as you'd expect from this brewery. It was cool too. So there we have it. 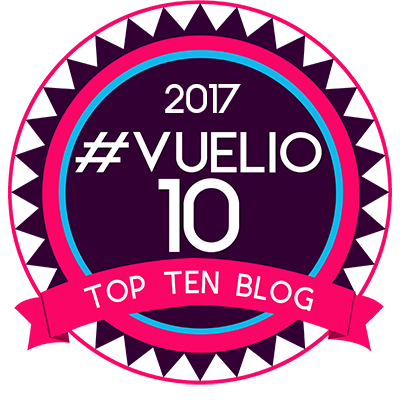 Five GBG pubs visited and four were up to snuff and one just wasn't. I guess that's probably par for the course, but I'll try the Crutched Friar again soon. All in all, a good result for the Good Beer Beer Guide. I'm in London for a few days. Despite it being my other home, I kind of regard it as a holiday, so like on all holidays, I'm going to have a few beers. In the pub of course, though my fridge here has one or two beers that need supping soon. (Rogue Shakespeare Stout and Stone Russian Imperial Stout might make an interesting comparison I suppose, but if I drank two very large bottles of those, I might be a bit pissed.) So it's the pub. Where to go is the problem. 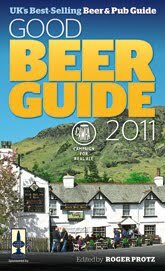 I'm going to use my new Good Beer Guide 2011 (GBG)I think and see where that leads me. The good news for pubs is that my Cask Marque thermometer's whereabouts cannot be determined, so it'll just be "too warm" or "temperature fine", or, in extreme cases, "very warm". I have already made a start though. I popped into the Bree Louise as I passed. Now this pub has a very bad record, so I wasn't expecting much. My first half of Adnam's Koelner was murky and undrinkable and was exchanged for a rather tasty (but way too warm) half of Dark Star Espresso, so no improvement there. 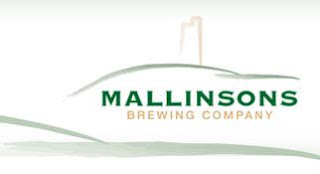 Later I had a pint of Itchin Valley Single Hop (Cascade) which was served in top condition and lacked only hops! That was in my local JDW, Goodman's Field, which like the Bree Louise, unaccountably has Good Beer Guide status. Unlike the Bree Louise, it did have good beer on this occasion. Later if I'm up to it, I'll stroll across Tower Bridge and seek out Dredgie who is apparently haunting the area tonight. E has (so far) declined to accompany me for that excursion, as she has work tomorrow. I don't of course. Retirement has many advantages. Today I received some photos of the Oktoberfest from my friend Moyra who has lived in Munich for many years. She took them today (yes I know they say 3rd October, but that's what she said), though as far as I know she doesn't drink beer. Can't exactly guarantee that mind you, since I haven't seen her since 1972! I have already complained to her that she hasn't included enough young women in dirndls, but you can't have everything I suppose. Nonetheless I was struck by the first photo. It isn't often you see an Oktoberfest tent this quiet. This contrasts with yesterday when the area was closed to visitors with beer tents and beer gardens in the area having to be closed for several hours due to overcr owding. The historic Wiesn area was packed within 45 minutes of opening and the entrance was closed by noon. On Saturday though the 800,000 crowd got ugly according to police with the "folksy" mood being lost and incidents with beer mugs rising as the jam-packed atmosphere (and copious drinking) frayed tempers. Süddeutsche Zeitung reported that the number of assaults with the festival’s famous one-litre glass beer mug rose from 38 last year to 60 this. Somehow, the thought that I might be brained by a maßkrug at Oktoberfest hadn't occurred to me. I'll bear it in mind now. It all ends tonight in perfect weather and hopefully perfect tempers! Picture yourself in a rain sodden Cumbrian village on an October Wednesday. This is power shower rain, drumming down relentlessly, with the kind of ferocious insistence that makes you wonder if you should start building an ark. Fortunately for us, we weren't seeking a cup of tea refuge from a tent or caravan, nor traipsing some God forsaken Cumbrian fell, but heading for a beery bright light in all the gloom, the Hawkshead Brewery Hall in Staveley. I first encountered the building last year when judging beer at the Society of Independent Brewers (SIBA) North competition and was very glad to be back. It is in a somewhat unlikely location, just off the single main road, in an industrial estate, amongst all sorts of other odds and ends of business, in what is a small Cumbrian village, much as any other. It can probably be fairly described as a large metal shed. But this a actually a rather remarkable place. The brewery and hall are the brainchild of Alex Brodie, a former BBC Foreign Correspondent, who exchanged a life of danger, for the perhaps just as precarious, but less fatal career of micro brewing. He started out in Hawkshead itself, but soon outgrew his previous premises and moved here. It is very impressive. Belying its external industrial look, it is all light wood and metal inside, with benches and wooden tables and a warm atmosphere. The stainless steel, German built brewery is off to one side and can be seen through viewing panels. The barstaff are friendly and welcoming. When we called Alex was in a meeting, so we sampled the beers on offer. 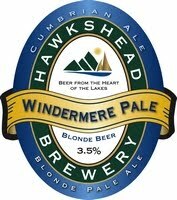 There were five Hawkshead beers on the bar, but we all plumped for Windermere Pale, a 3.5% golden coloured hoppy ale, more of which later. Despite what might be thought of as a remote location, on a bad midweek day, the hall was fairly busy. Apparently it is packed at weekends. It also holds a couple of large beer festivals each year, which are always sell-outs. It is clearly doing something right. We marvelled at our beer. It was pale, golden, properly conditioned and clear as a bell. It packed in so much hoppy taste and wasn't, unlike a lot of weak beers, thin. It was superb. Hawkshead Bitter is its "big" brother. It's a proper light brown session beer, with a good body and an easy drinking style, through to a bitter lingering finish, weighing in at only 3.7%. We were to encounter it again many times in the forthcoming days and it didn't disappoint once. When Alex joined us for a pint, we asked him about the Windermere Pale. It has a complex hopping regime he says, with Fuggles, Styrian Goldings and Bramling Cross among others, but it is the addition of the wonderful Citra hop that really brings this beer to your notice. Alex is brimming with energy and enthusiasm. Despite having a beer that would make other brewers weep with jealousy he says " I think we can squeeze a bit more flavour in." We discuss the Citra. He has bagged what he reckons is the lion's share of what is still available in the UK. A definite "A" for foresight there. Nor is Alex a man to r est on his success. He takes us round the existing brewery, then through a plastic curtain to the large unit next door, which is being transformed into a brewery extension, further bar, kitchen and shop. No cobbled together job this, with hand crafted ash everywhere and in pride of place, two towering, gleaming, 75 barrel dual purpose fermenters/conditioning tanks, needed as they simply can't keep up with current and projected demand. It is very impressive. Heading back to the brewery we look at the brewing operation. After fermentation all the beers are held in conditioning tanks for three days. This allows the beers to mature a little and to drop out some more trub. It makes them astonishingly clear and clean tasting, while allowing a very healthy viable yeast count for secondary fermentation. It is this kind of attention to detail which makes the beer so good. Back in the bar we try the remaining beers and discuss the forthcoming Great Northern Beer Festival, which Alex is organising from the SIBA end. I'm involved too. It's an ambitious project and I'm glad that Alex is the SIBA man. You just know he'll pull it off. He's that kind of person. As Alex heads back to work, we have a taste of the Organic Stout which impresses too, before braving the elements once more. By this time, the rain has reduced to a downpour and we head to the local pub for lunch. Of course Hawkshead Bitter is on the bar. It really is heartening to see a brewery doing so well with what might be called mainstream beers. We encountered them all over Cumbria and it was easy to see why they are so popular. While there is always a place in brewing for innovation, extremes and odd ingredients, there can still be success to be had by making beers that aren't too strong and that people want to neck by the pint. Long may it remain so. Alex is second left with the "boys".